Senators who voted last week to Fast Track ratification of the Trans-Pacific Partnership (TPP) call it a free trade deal, but really, it’s forced trade imposed on protesting American workers who have endured its damaging effects for decades. Under the free trade regime, rich and powerful corporate interests have hauled in ever-higher profits as they shipped manufacturing overseas to low-wage, no-environmental-regulation countries. Meanwhile, American workers lost jobs, health benefits, income and all sense of stability. For the past 50 years, the government provided compensation to some American workers who suffered because of trade deals. They got Trade Adjustment Assistance, a little bit of money to help them subsist and retrain after losing their jobs. Now, the wealthy beneficiaries of free trade, and the Republicans they fund, contend that senior citizens should pay the cost of Trade Adjustment Assistance. That Republicans feel it’s appropriate to cut Medicare to cover the cost of Trade Adjustment Assistance illustrates how deeply flawed American trade policy is. It is based on the philosophy that workers and the retired should suffer to facilitate the rich getting richer. 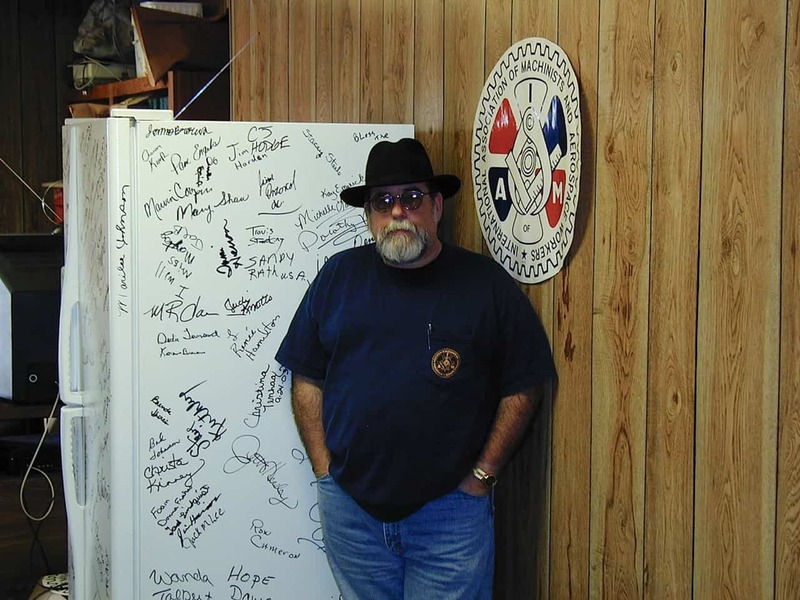 Photo by author Chad Broughton of Dave Bevard, former Machinists local union president at the Maytag factory in Galesburg, Ill., standing beside the last refrigerator produced there in 2004 before the corporation moved production to Mexico. The refrigerator is autographed by some of the 1,600 workers who lost their jobs. The misery that corporate-pandering free trade deals inflict on workers is both acute and lingering. It is the reason so many Democrats in the U.S. Senate last week voted against Fast Tracking the TPP. It is the reason so many Democrats in the House will oppose Fast Track. Chad Broughton, a lecturer in public policy at the University of Chicago, chronicled the struggles of 1,600 workers thrown out of jobs by free trade a decade ago. They made Maytag refrigerators in Galesburg, Ill., until Maytag closed the plant in 2004 and moved it to Mexico. Broughton’s book, “Boom, Bust, Exodus” describes the aftermath. In an interview with the New York Times, he refuted the contention that the low price of imported refrigerators and televisions and coffee makers offsets the costs to workers of lost jobs, benefits, pensions and futures. “The decline in the quality of life for working-class families has not been nearly matched by the low, low prices,” he said. The Times also quotes George Carney, who lost his job as a forklift driver when Maytag closed its massive refrigerator factory in Galesburg. Carney told of his bitterness that the North American Free Trade Agreement (NAFTA) encouraged Maytag to abandon made-in-America for foreign manufacturing. Carney worked for a time as a bartender, a position hardly comparable to the well-paying, union job Maytag took from him. A few furloughed workers in Galesburg managed to get better jobs, but many, Broughton found, did not. That’s what economists have found as well, among them, Josh Bivens, policy director at the Economic Policy Institute. He determined that while free trade raised the national income, it reduced the income of most workers. What that means is a small number of people benefits while the majority suffers. When Maytag moves a refrigerator plant from Illinois to Mexico, it damages far more workers than just the ones it hands pink slips. In Galesburg, for example, the ill-effect of 1,600 Maytag workers suddenly without paychecks surged across the community of 32,000. Businesses closed. Those workers lost their jobs. The community’s tax base shrank. The city’s median household income fell 27 percent between 1999 and 2013. Everybody suffered. Except Maytag, of course. This continues to occur across the country. Since NAFTA, 60,000 manufacturers closed and 5 million jobs disappeared. Communities crumbled. Corporations profited. Bivens calculated the cost of free trade to a median wage worker without a college degree is $1,800 a year. Despite the magnitude of the pain from free trade, the administration is pushing the TPP, a proposed agreement with 11 Pacific Rim countries that would be the biggest free trade deal ever. President Obama says he needs it so that the United States and these 11 partners establish the rules for trade instead of China. That’s essentially the same thing that President John F. Kennedy said in 1962 when he sought expanded trade. He contended America had to secure trading partners before those countries made deals with the Soviet bloc. That’s not how Republican leaders and conservative groups see it now, however. They oppose Trade Adjustment Assistance. This includes powerful right wing organizations like Club for Growth and The Heritage Foundation and GOP lawmakers like U.S. Rep. Paul Ryan, sponsor of the House bill to Fast Track the TPP through Congress without deliberation or amendment. Despite that, Ryan included Trade Adjustment Assistance in his Fast Track bill. That’s only because, he conceded, it’s “necessary to get it passed.” In other words, he needs some votes from Democrats. He and Senate Republicans paid for part of Trade Adjustment Assistance, though, by cutting $700 million out of Medicare. They believe none of the corporations that profit from offshoring U.S. factories should bear any of the costs to workers, families and communities. Instead, they think if a worker loses his job because of free trade, then both he and his retired, Medicare-dependent parents should suffer. Although Medicare didn’t begin until after John F. Kennedy’s assassination, JFK never would have cut it to pay for Trade Adjustment Assistance. He believed Trade Adjustment Assistance was amends owed to workers by the nation as a whole, not the elderly as a subgroup. This is deeply personal to my union, the United Steelworkers (USW). Right now, more than 5,000 Steelworkers across the country are laid off because of illegally subsidized steel dumped into the United States by China. Again and again, the USW has pressed for enforcement of trade laws after USW members lost jobs because foreign countries violated trade rules and dumped tires, paper, auto parts and other manufactured products into the U.S. market. Since Kennedy’s time, trade policy has increasingly served the 1 percent, not the nation as a whole. It is a tax forced on workers to provide revenue for the rich.